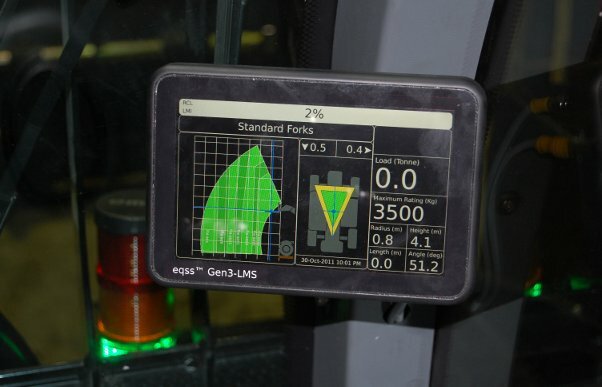 The Gen3-LMS is composed of a small number of sensors placed around the telehandler, they are connected together using a CAN bus network. The Model 6202 CAN Safety Display Module is a state of the the art embedded computer specifically designed for use with industrial lifting equipment. The slim line display features a 7” wide screen high definition LCD screen capable of displaying high quality graphic effects to better assist the machine operator. The display unit incorporates stereo speakers with advanced warning alarms via tones and voice messaging. The display takes advantage of the latest in computer technology providing the operator with information such as the digital rating chart with forward prediction, active shading and zoom, plus the machine dynamic stability triangle. The CSDM has a NTSC / PAL video input used for reverse, forward and remote cameras. The CSDM safety processing software and operating system is easily updated via an on-board SD card, the CSDM operating system includes advanced menu functions for instant system configuration and diagnostics. The Model6259 CAN Cabin Interface Module is a universal and fully configurable digital IO module, with smart power management and backup battery. This unit has a small footprint and is designed to be mounted within the cabin of a machine to provide the interface between the machine electrics and the EQSS technology. The CCIM has an array of configurable input and output channels that can be used to sense signals such as outrigger positions and control machine cut-outs. The module features tri state input channels to effectively handle any type of digital input signal thus eliminating the need for signal conditioning on the machine side. This module incorporates smart power management circuitry along side the back up battery which is used to keep a portion of the system powered for the GPS tracking and 3G data access in the event that the main power source is lost. The module additionally incorporates a universal analogue input and a dedicated machine override timer, all connections into the module are made via a robust easy to use, aviation grade snap lock connector system. The Model6231 CAN Light Tower Module is designed to provide personnel outside the machine, an indication of the current machine state. The CLTM receives information from the safety system which relates to the machines state of operation. 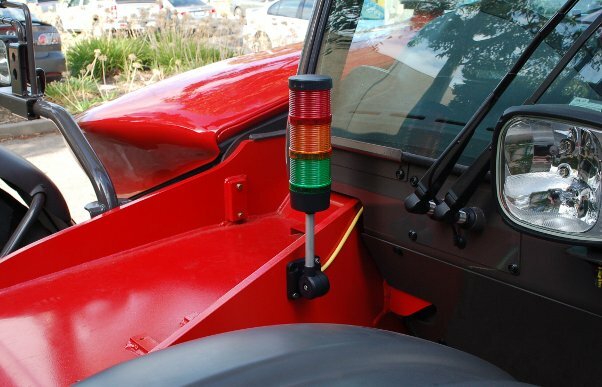 The module comes standard with three indication states of green, yellow and red, additional indication states can be added if required. The light tower uses LED's to illuminate each colour section, these LED's operate at low power and have an increased life over traditional indication solutions, making the module robust and long lasting. The CLTM can be added to any of the EQSS complete system solutions by simply plugging the unit in on the CAN bus, once connected the CLTM is automatically detected and starts operating, removing the need for special system configuration. The Model 6258 CAN Pressure Input Module functions as an integrated system node for pressure / load measurement, level calculation and external IO control. 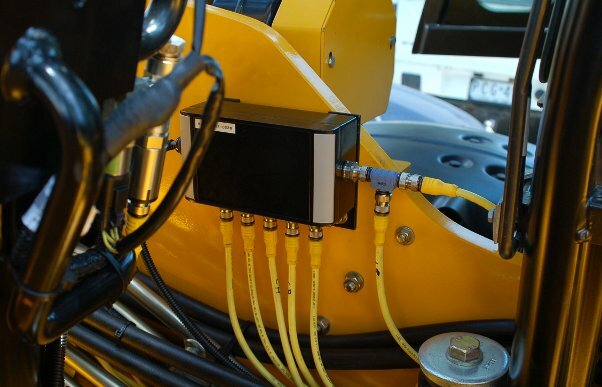 The CPIM contains a dual axes inclinometer used for machine chassis level determination and several digital inputs and output channels that can be configured for outside cabin use as required. The CPIM has been designed to accommodate a wide variety of sensor inputs for the purpose of load, tension and pressure measurement. The sensor input channels can connect to any style of pressure or load sensor device for easy adaptation and migration from application to application. The CPIM is housed in powder coated die-cast aluminium IP69 rated enclosure giving the unit unparalleled protection in harsh environments. The CPIM connects to the main system processing node via a CAN bus allowing the unit to be positioned without the need for complex wiring configurations. The Model6206 CAN Angle and Length Module is designed as a small all-in-one unit for measuring angle and length in industrial lifting applications. 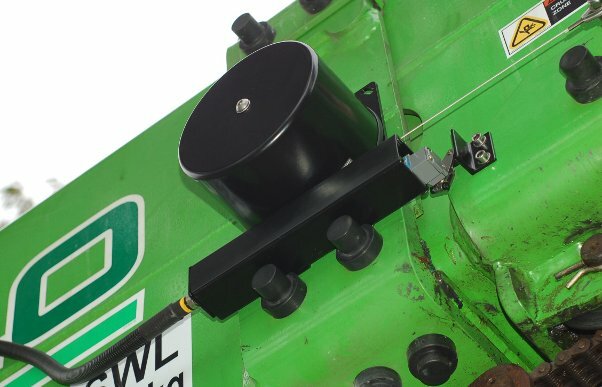 The unit has been designed to fit onto the outside or inside of a telescopic boom, with its small footprint, low profile and M12 screw lock connector system makes it easy to install. 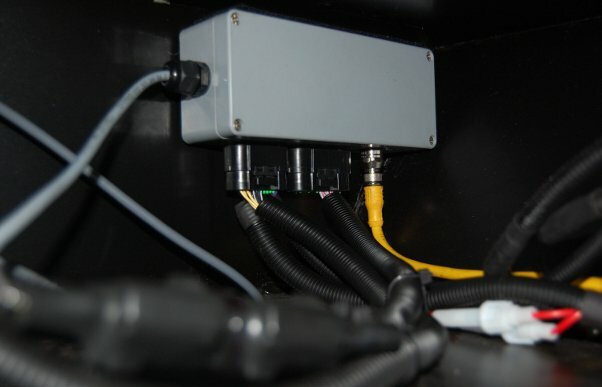 The CALM uses unique quadrature encoding for the length measurement and solid state accelerometers for angle determination, making the unit fully digital and self calibrating. The internal recoil spring is protected against reverse recoil in the event of trace cable breakage via an internal clutch mechanism.